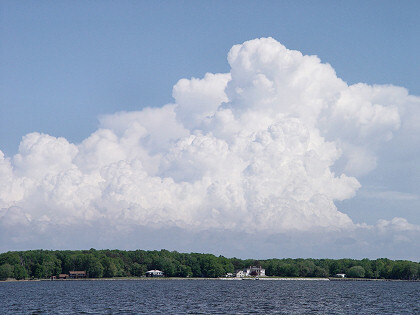 A pile of puffy cumulus clouds building over the Eastern Shore. Jerome gave me long stint at the helm as we crossed the bay from the Eastern Shore back towards the Severn. We tried to clear Tolly Point (the shoal just south of the Severn) without having to tack again, and we were successful. It's really neat arriving at Annapolis by water. In addition to the busy harbor and vibrant waterfront, there's just something about the lay of the land and water that makes it a perfect destination for a small boat. 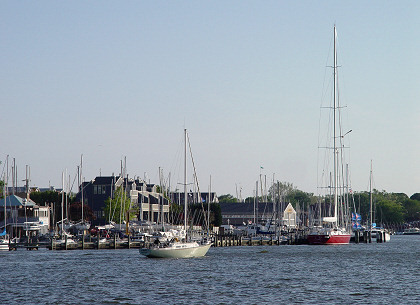 That's hardly surprising, though, since the location was selected over 300 years ago with just that purpose in mind, and ever since then, Annapolis has been a center of small boat activity. We didn't want to pay for a mooring, so at first, we anchored off the Naval Academy seawall. Although the price was right, the anchorage was very exposed to the east, with the unforgiving riprap of the seawall close by to the west. The forecast had been calling for thunderstorms, and towards evening, we saw the western horizon cloud up as a storm approached. Jerome decided to move the boat to Spa Creek, but we had to wait a while since the Spa Creek Bridge remained closed during the evening rush hour. While we waited, I re-ran the mainsail reefing lines to uncross them. At first, I didn't understand the purpose of the stainless-steel bail at the end of the boom, so I ran the reefing lines above the bail so they would have a fair lead and wouldn't chafe on the bail. When we tried to zip-up the sail storage pouch, though, we saw that the reefing lines interfered with the zipper, so I had to re-run the lines to go back under the bail (even though that causes some chafe). Now the Mack Pack could be zipped up without any problems. Other boats at anchor off the Naval Academy seawall (visible as a dark line where the water ends). This view is looking approximately north, so the trees in the background are on the far side of the Severn. Looking southwest towards the Eastport waterfront. 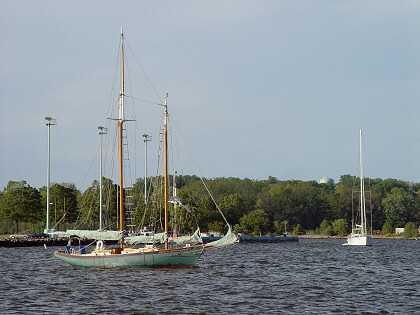 The sailboat entering the harbor is heading towards the mooring field. We had to wait until 7:30 p.m. for the bridge to open, and we were ready and waiting when the bells rang, the lights flashed, and the bridge halves slowly cranked upright. Jerome motored up Spa Creek and we both looked for a decent spot to drop the hook. The problem is that the city has saturated the creek with mooring balls, so all the good anchorages were infested with moorings. As before on Back Creek, there were a couple of spots where they forgot to put a mooring, but the spots were already occupied by other anchored boats. The frustrating thing is that most of the moorings were unoccupied, so the city wasn't earning any revenue, but the unused moorings cluttered the creek and prevented boats from anchoring. Therefore, all this supposedly public space was wasted, with the mooring balls acting like "keep out" signs. Anyway, we circled around a couple of places as daylight faded, then Jerome selected a spot near Truxtun Park and dropped the anchor. The location was only so-so since space was tight and he could only let out 50' of chain. Even then, if the wind increased and the anchor chain stretched out, we might get too close to a nearby private dock. There was a residential neighborhood on one side of the narrow creek, and it seemed like we were anchored practically in their backyards (we were close enough to look right into their windows and see their televisions playing). The other side of the creek was part of Truxtun Park (a woodsy Annapolis city park) and was considerably more scenic. I worried a little about problems if a thunderstorm blew through, but except for a little distant lightning, the storms failed to materialize and the anchorage remained peaceful. The pumpout boat owned by the City of Annapolis. Like it says on the side of the boat, you hail them on channel 17. Boats sailing in the mouth of the Severn River, as seen from the anchorage off the Naval Academy seawall.